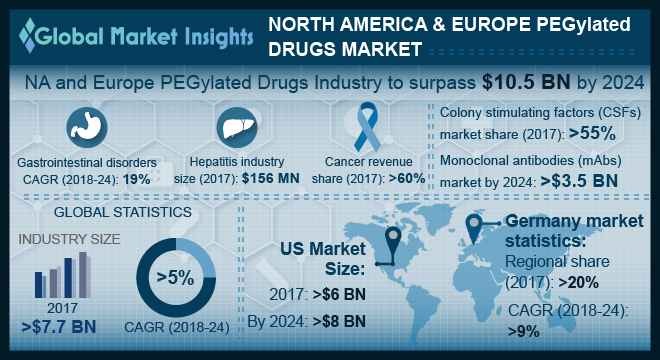 North America and Europe PEGylated Drugs Market size is set to exceed USD 10.5 billion by 2024; according to a new research report by Global Market Insights. Increasing R&D investment of biotechnology & pharmaceutical companies to develop enhanced PEGylated drugs for treatment of various chronic diseases along with rising occurrence of chronic ailments in developed regions will propel PEGylated drugs market growth over the forecast period. Major advancements in biologics sector including advances in drug antibody conjugates, and immunotherapies will positively impact market growth. Moreover, rising incidences of chronic ailments and increasing death rates associated with cancer in Canada will propel industry growth. However, the side-effects associated with pegylated drugs along with drug failure will impede PEGylated drugs market growth over the forecast timeframe.